Standing on the top of St Catherine's Down, above Blackgang Chine is the St Catherine's Oratory, also referred to by locals as the Pepper Pot. 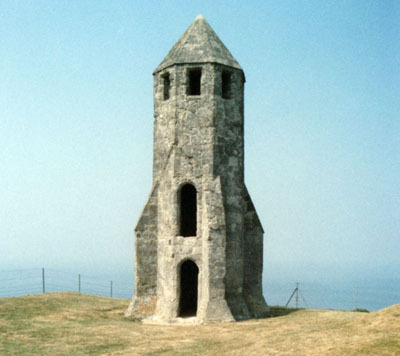 This octagonal tower is the remains of a medieval lighthouse. Originally built in 1314, and provided with an endowment, by Walter de Godeton as penance from the Pope for stealing wine bound for the monastery of Livers in Picardy from a ship which was wreaked on Atherfield Ledge. The lighthouse was manned by a priest who tended to the light and said masses for the souls of those lost at sea. At the Reformation (circa 1530), the Oratory lost its endowment and ceased to be manned but the tower remained and was used as a seamark.